During this afternoon, the weather was dreadful. We met around a table of the Melting Pot Pub. Us ? Olivier Moly and me ! Olivier Moly is a photograph from Blagnac’s city. He first left France for a long stay in Australia. But his adventure’s desire brought him to the road of New Zealand. With his backpack, he took the Te Araroa, New Zealand, walking track of 3,000 kilometers. In December 2012, his road began. 167 days later, he achieved his adventure at Stirling point, final point of the Te Araroa. 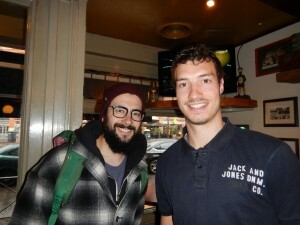 During his travel, he wrote a blog (http://throughteararoa.com/) ; Have a look at his website ! After he offered me one beer, we talked about many subjects around our projects. He shared his experience and he gave me some suggestions. More than 3 hours of discussions later, we imagined solutions to improve our project. Before leaving my friend, we took one picture. To conclude, Olivier is an amazing meeting and a generous guy. City of Blagnac, Official Sponsor.